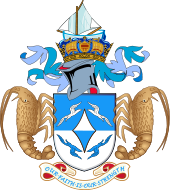 The Tristan da Cunha Island Council is the legislature of the island of Tristan da Cunha in the Atlantic Ocean. The composition of the Island Council consists of the Administrator as President, plus three appointed and eight elected members. At least one elected member of the council must be a woman. The 12-member Island Council consists of the Administrator as President, three appointed members and eight elected members, who are elected by plurality-at-large voting. At least one elected member of the council must be a woman. If there are no women among the eight candidates that receive the most votes, only the top seven male candidates are declared elected, alongside the woman that received the highest number of votes. If there are no female candidates, a by-election is held for the eighth seat, in which only female candidates can stand. The Chief Islander is elected on a separate ballot by first-past-the-post voting, and must also be elected to the Island Council to be eligible to become Chief Islander. In 2007, the following were elected to serve on the Island Council: Lorraine Repetto, Conrad Glass, Robin Repetto, Dereck Charles Rogers, Ian Lavarello, James Patrick Glass, Iris Green, Lillie Carlene Swain, Lorraine Repetto, Conrad Glass, Robin Repetto, Dereck Charles Rogers, Ian Lavarello, James Patrick Glass, Iris Green, Lillie Carlene Swain. The following were co-opted by Administrator (all had previously been Chief Islanders): Harold Green, Anne Green, Lewis Green. The turnout at the election was 56.2%, markedly lower than in previous years. In 2010, all the council posts were uncontested (an election had been scheduled for 10 March). The following candidates were therefore returned without election: Ian Lavarello, Robin Repetto, Marion Green, Beverley Repetto, Dereck Rogers, James Glass, Lorraine Repetto, Iris Green, Dawn Repetto, Conrad Glass, and Anne Green. As with 2010, there were eight nominations for the eight places on the Island Council so an election was not held and all candidates were automatically returned. Apart from Ian Lavarello, all the new councillors had not served before. The returned candidates were: Leon Glass, Warren Glass, Joanne Green, Ian Lavarello, Gerald Repetto, Beverley Swain, Emma Swain, Neil Swain. Additionally, the Administrator co-opted Iris Green, Conrad Glass and Lorraine Repetto. ^ Ian Lavarello was also elected as Chief Islander of Tristan da Cunha for a third consecutive term. He has served in this position since April 2010. ^ Prior to Lavarello's election, Conrad Glass was the Chief Islander of Tristan. ^ "Profile of Conrad Glass Chief Islander 2007 - 2010". Tristan da Cunha Government. Archived from the original on 23 June 2014. Retrieved 23 June 2014. ^ Sarah Glass, "Tristan's Election Results", Tristan Times, 4 April 2007. Retrieved 28 November 2017. ^ Juanita Brock, "New Island Council elected to serve until 2013", Tristan Times, 28 May 2010. Retrieved 28 November 2017. ^ "Tristan Island Council 2010–2013", Tristan da Cunha. Retrieved 28 November 2017. ^ "Tristan Island Council 2013–2016", Tristan da Cunha. Retrieved 28 November 2017. ^ "Chief Islander", Tristan da Cunha. Retrieved 28 November 2017.